Ed Sheeran and Taylor Swift run into some technical difficulties during their duet while on tour, and lucky for us it's all on caught tape! Jun 08, 2013 · Taylor Swift & Ed Sheeran performing their single 'Everything Has Changed' live on the Britain's Got Talent Final 2013. 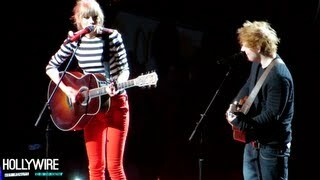 Watch this Taylor Swift video, Taylor Swift & Ed Sheeran Duet Goes Wrong! ('Everything Has Changed'), on Fanpop and browse other Taylor Swift videos.